Accordingly Leonardo Piccioni has fashioned two variations of a potential flag for the county. 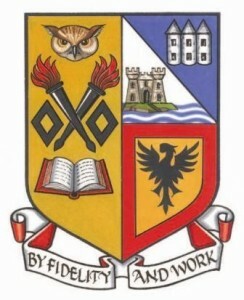 Both designs depict a silhouette of the castle in white, against a green backdrop, representative of the rather lush island terrain where it is situated; the island is similarly green on the council’s arms. In base, the traditional aquatic reference of blue and white wavy stripes in base, as found on the arms, symbolises Loch Leven. On the former council’s arms the roof of the castle is shown with a pitched roof and an apex and the first of Leonardo’s proposals reflects this depiction. the castle is realised as it actually stands today, with a crenellated flat roof. 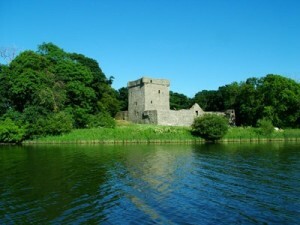 A similar depiction of Loch Leven Castle appears on the arms of the local Perth College, of the University of the Highlands and Islands. This entry was posted in Kinross-shire. Bookmark the permalink.